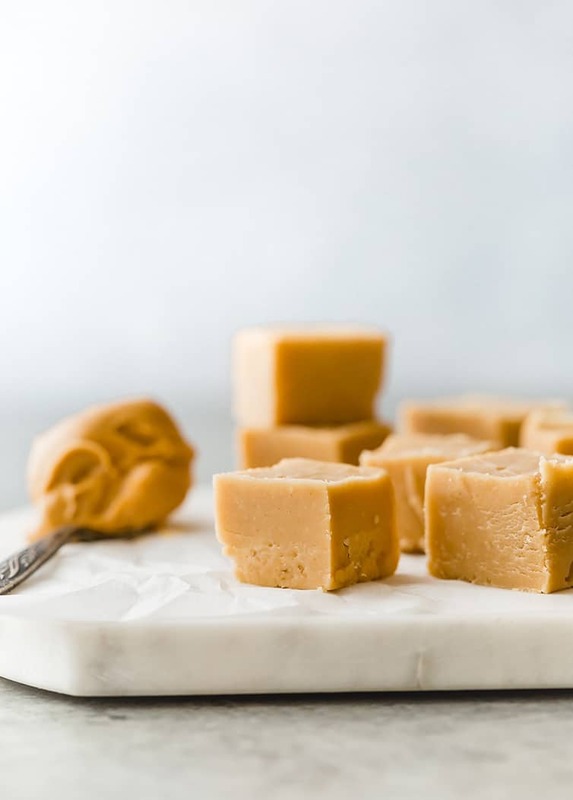 This easy, creamy peanut butter fudge recipe is the BEST! Only 4 ingredients and 10 minutes of prep time; perfect for the busy holiday season. Are you a fudge person? Like, a legit fudge person? 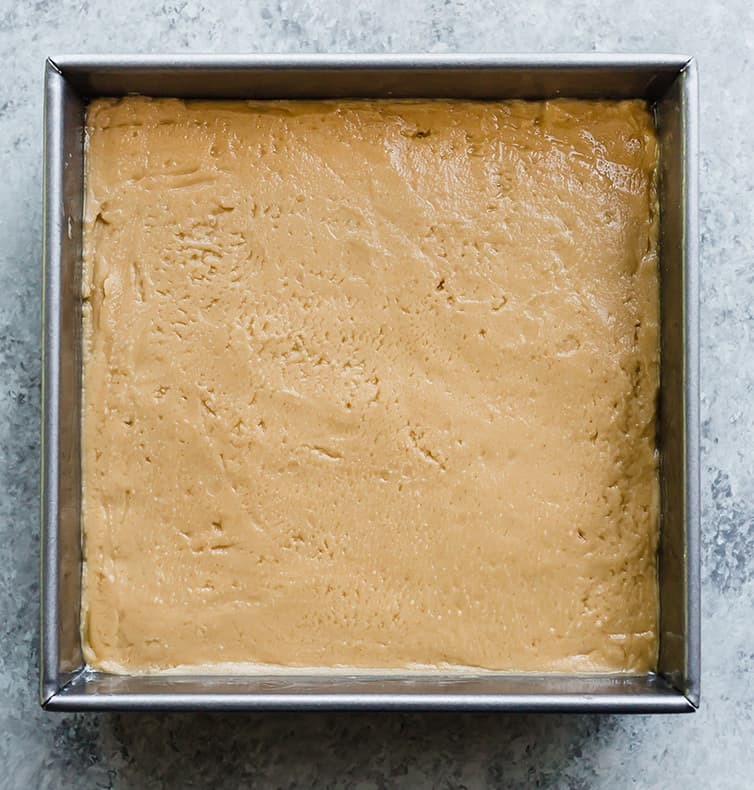 Our family doesn’t have a solid fudge tradition; it will show up on cookie trays occasionally, but I don’t have memories of my mom or grandma standing over pots of fudge and stirring, stirring, stirring until it was just right. 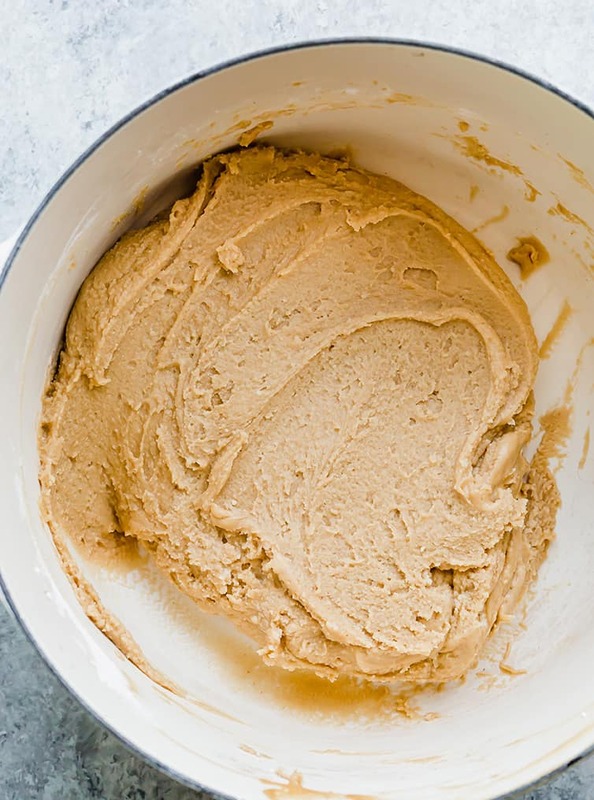 So I’ve forged my own fudge path, and about 10 years ago, I – a massive peanut butter fanatic – realized that my repertoire was missing peanut butter fudge. I quickly set about righting that wrong. 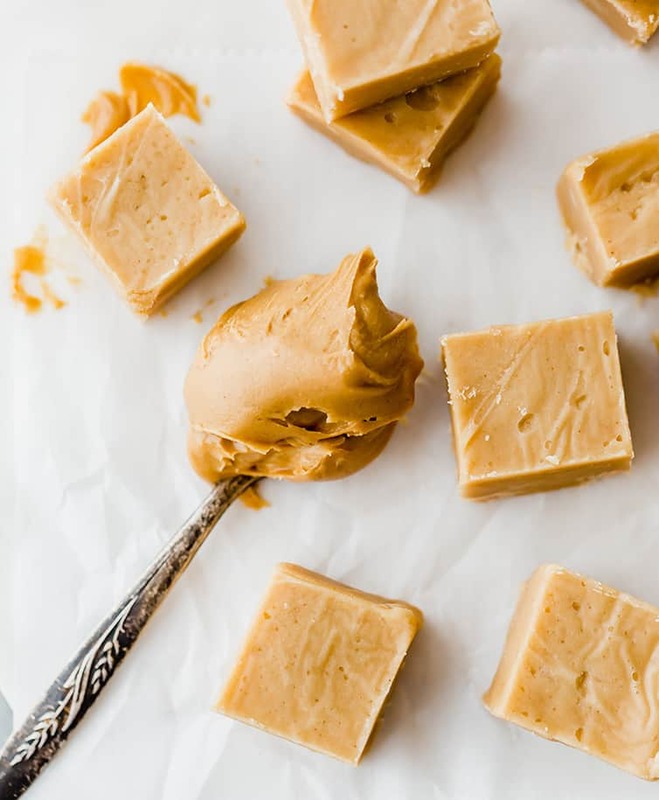 I love peanut butter fudge because it is infinitely easier than chocolate fudge and, well, it’s peanut butter fudge. What’s not to love? No candy thermometers or intensive stirring required. 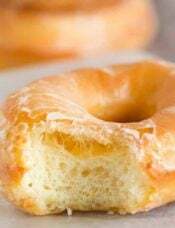 All you need is butter, peanut butter, a pinch of salt, vanilla, powdered sugar and about 10 minutes. It is so easy, super forgiving, and makes the BEST fudge! 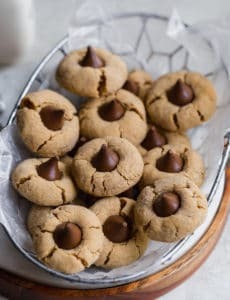 This recipe is seriously SIMPLE, and don’t we all need a little something simple on our baking to-do list this season? In a word, YES. Let’s get to it! First, you’re going to combine butter and peanut butter in a saucepan and bring to a boil. As soon as it hits that point, remove from the heat and stir in the salt, vanilla extract, and powdered sugar. Spread it into an 8-inch square pan, cover with plastic wrap and refrigerate until it has set up, which only takes about an hour. That’s it! Can you believe it? Seriously the easiest, most failsafe, DELICIOUS fudge on the planet. 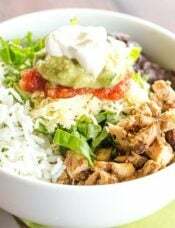 You can make this in the microwave! 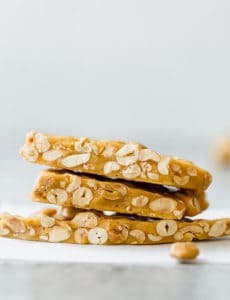 Place the butter and peanut butter in a large microwavable bowl; cover with a paper towel and microwave on high for 2 minutes. Stir, microwave for 2 more minutes, then proceed with the rest of the recipe as written. If you don’t have an 8-inch square pan, you can use a 9-inch square pan, but the fudge will not be as high. The fudge can be stored in an airtight container or in a freezer ziploc bag for up to 3 months. I think the best part about this fudge might be that it tastes just like the inside of buckeyes (another holiday staple! ), except the fudge involves less steps and also less time. But no chocolate, so I guess it evens out! 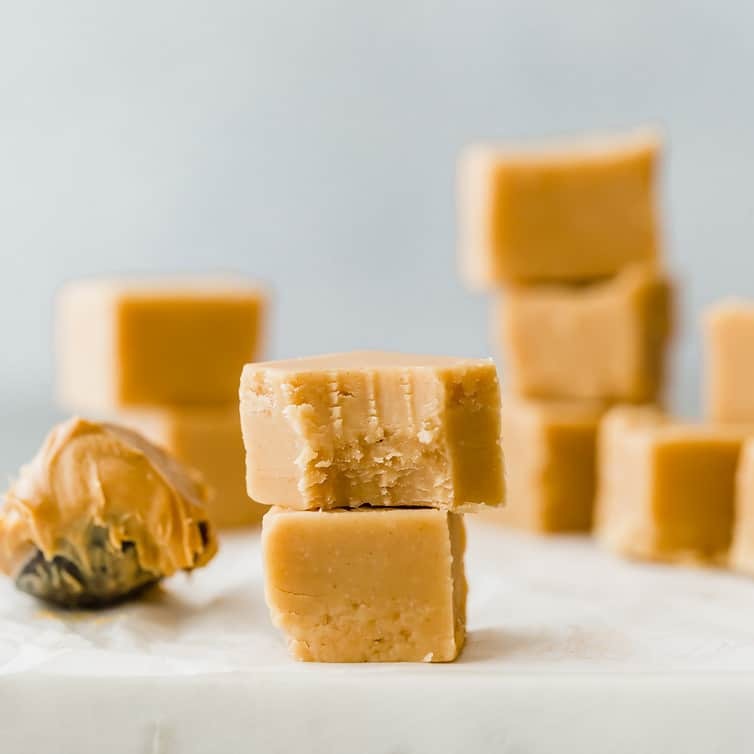 If you need a peanut butter fudge recipe that does not require milk, that can be made in just 10 minutes and with ingredients you likely already have at home, look no further. 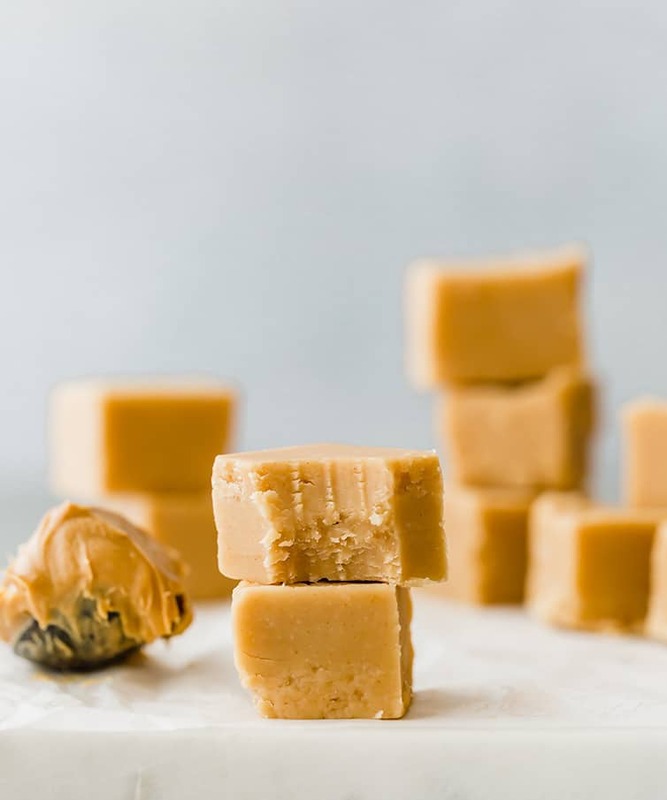 This fudge takes little effort and will be a huge hit on all of those gorgeous cookie trays you’re going to build in a few weeks! 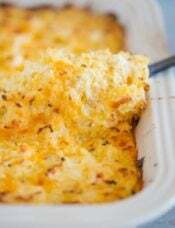 Butter an 8-inch non-stick baking dish (or line with buttered parchment paper) and set aside. 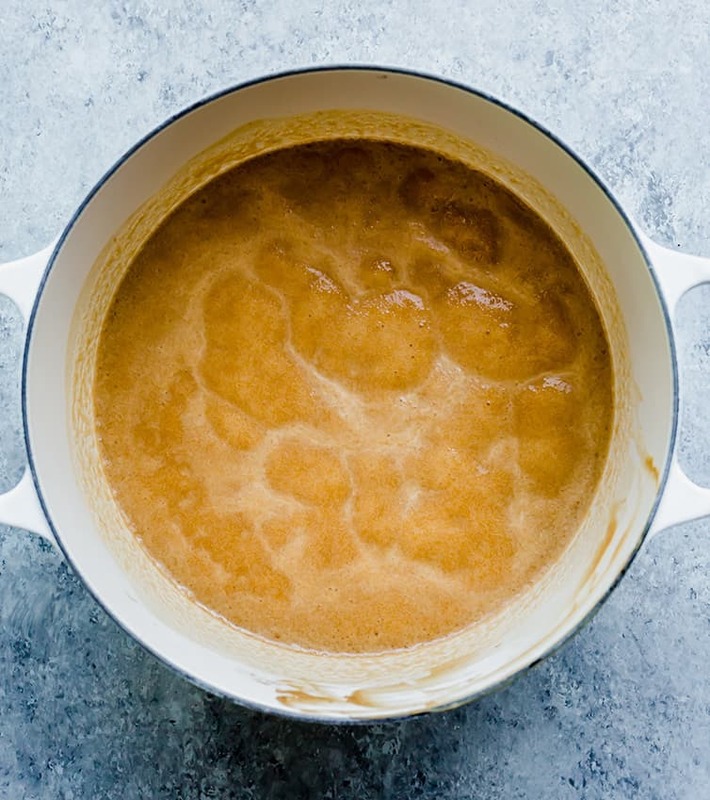 In a medium saucepan over medium heat, heat the butter and peanut butter until the mixture comes to a boil. Remove from the heat. Add the salt and vanilla extract, then stir in the powdered sugar until smooth and no lumps remain. Pour the fudge mixture into the prepared pan and smooth the top. Press a piece of plastic wrap directly on the fudge and refrigerate until set, at least 1 hour. Cut into squares and serve. 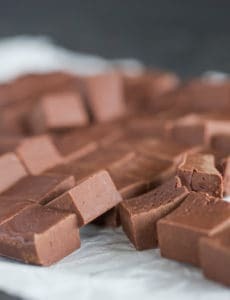 Fudge can be stored at cool room temperature in an airtight container for up to 1 week, or in the refrigerator for up to 1 month. If you don't have an 8-inch square pan, you can use a 9-inch square pan, but the fudge will not be as high. Update Notes: This recipe was originally published in December 2010. 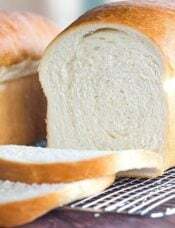 Updated in December 2018 with new photos and updated recipe tips. I had to throw away. It was just a glob. It had way too much confection sugar. Maybe should have used 2 cups instead of 4. The best. I used the stovetop method. 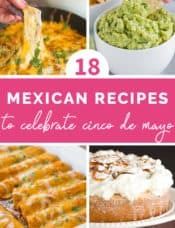 Wouldn’t bother using another recipe from here on out- my go to! 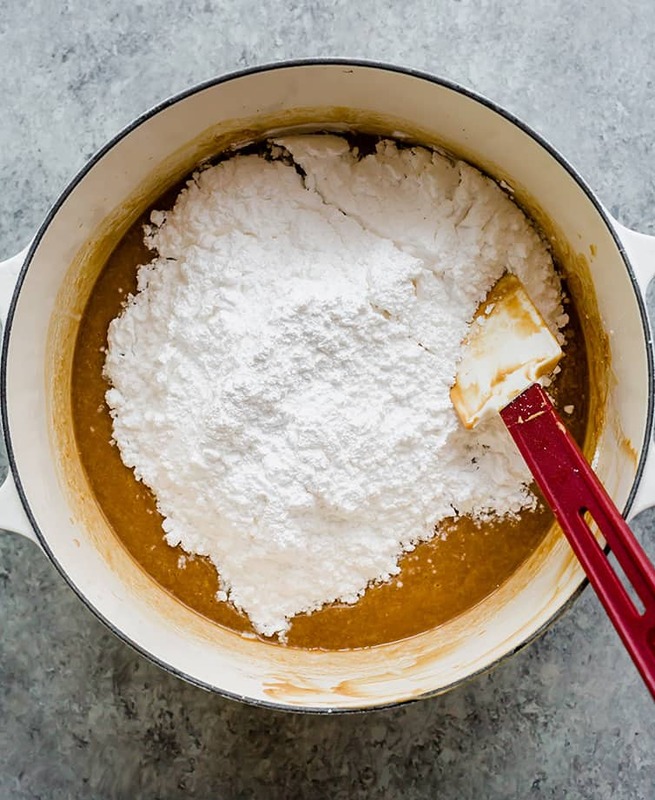 One thing I do think is extremely important in any baking but especially something like this that’s so rich and flavor- forward— USE GOOD BUTTER. It’s worth it for the best result. I used Keri gold for mine. Thanks! I used to make Fantasy Fudge (on back of Marshmellow Creme jar) as a teenager w/ great success. As an adult, it never turns out. The only change I make is to used Guittards dark chocolate chips in place of Nestle’s semi sweet. It does not set and turns out like thicker frosting, so difficult for people to eat w/out getting messy. This year it was very soft, so I Googled and found out soft fudge is because of not getting it to 235-245 degrees w/ a candy thermometer. Growing up I never used a candy thermometer and had success, go figure…… Anyway I added some water per Googles recommendations and reheated for quite awhile to get it to pass the ice water ball test. What happened? It turned into a chocolate caramel which was so sticky I had to throw it out as I couldn’t even work with it to put it into small wax paper wraps. Ugh! What am I doing wrong? Do I have to go back to Nestle’s semi sweet morsels? Thanks. I made this last night;, it is unbelievably good! I folded in some crushed up peanut butter cookies for a fun crunch.. I’ll be gifting this to everyone this month! Wow this seems super easy to prepare!! 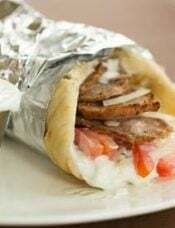 A definite must try!